Denise Lee Yohn and I have been intensely exploring choice and the consumer retail experience since the BRITE ’11 conference when we heard Sheena Iyengar describe the power of choice and The Art of Choosing , her new book. Choice in the marketplace is somewhat paradoxical. Not enough choice and customers assume you aren’t serious; too much choice and they walk away, overwhelmed. At the same time, as Ms. Iyengar pointed out, “today's marketplace is designed for experts, but we aren't all experts.” How then to make sense of choice to drive business? Denise and I decided to make sense of choice through a two part guest post series. Denise took on REI, a retail environment that definitely speaks to experts, yet also Makes Choosing Easy in her guest post on my blog, Flooring The Consumer. I took on Trader Joe's on Denise's blog - Brand as Business Bites - in a post titled Trader Joe's Where Less is More. I'll hope you'll read the post and let me know your thoughts on making sense of choice and how to make choosing an easier part of the consumer retail buying experience. Denise, thanks for the opportunity! Here you go: the latest 5/27/11 issue of Retail Experience in the News... recapping the latest articles and links shared on Twitter with the #retailexp hashtag this past week. Extremes in social commerce from a department store perspective http://ow.ly/50iV9 #retailexp Where are you? For previous issues of Retail Experience In The News, see Retail Experience News. Enjoy and thanks for reading! Have a great Memorial Day Weekend! If you enjoyed this article, consider subscribing to Flooring The Consumer via email or RSS. One of the highlights from the recent 2011 BRITE Conference was meeting IRL Denise Lee Yohn, a brilliant 'brand as business' consultant who regularly inspires me with her insights about brands, consumers and retail experiences. BRITE - and more specifically Sheena Iyengar, author of The Art of Choosing - got us thinking and talking. After multiple Twitter, phone call and email exchanges during which we explored perspectives on choice and customer frustration, retail innovation and how to improve the overall consumer experience, we decided on a blog series about choice in the retail experience. This guest post about REI and chosing represents Part 1 in a two-part blog series with my colleague, Denise Lee Yohn. In it, Denise addresses choice from her perspective as a consulting partner who helps retail companies operationalize their brands to grow their businesses. Next week, my post on the topic will appear on her blog - Brand as Business Bites. Somehow, REI, a big box retailer that sells outdoor recreation gear, sporting goods, and clothes out of retail stores of up to 95,000 square feet, as well as catalogs and its website, manages to make a broad product assortment manageable. 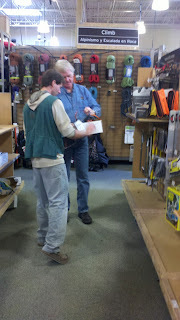 Actually, it’s more than manageable – shopping at REI is real treat. REI has figured out how to overcome the choice conundrum that plagues most large retailers (large in terms of size of store, e.g., 50,000 sq. ft., not necessarily in terms of the number of stores). The choice conundrum results from two opposing factors. On the one hand, large retailers want to offer a large selection of product. The more options you offer, conventional wisdom goes, the more likely you are to be able to meet customers’ needs. There’s an efficiency factor too – as long as you’re going to be paying for all that real estate, you should fill it up to maximize sales potential. And then there’s the desire of many retailers to surprise and delight customers through the shopping experience. They believe the wider your selection, the more ways to entertain people with opportunities for discovery. But there’s a growing body of research that proves too much choice is a problem. As I have written previously, it’s a fact that when faced with too many choices, consumers make poorer choices, derive less satisfaction from their choice, and may actually delay or discontinue their purchase. - Create confidence -- use expert or personalized recommendations to help people make better choices and to feel better about making them< It’s this last approach that is REI’s secret sauce. Well, I guess it’s not so secret. 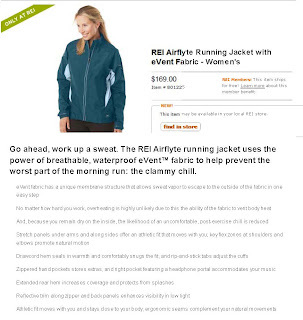 Examples of how REI uses expertise to create confidence are abundant. First, there's the in-store signage. 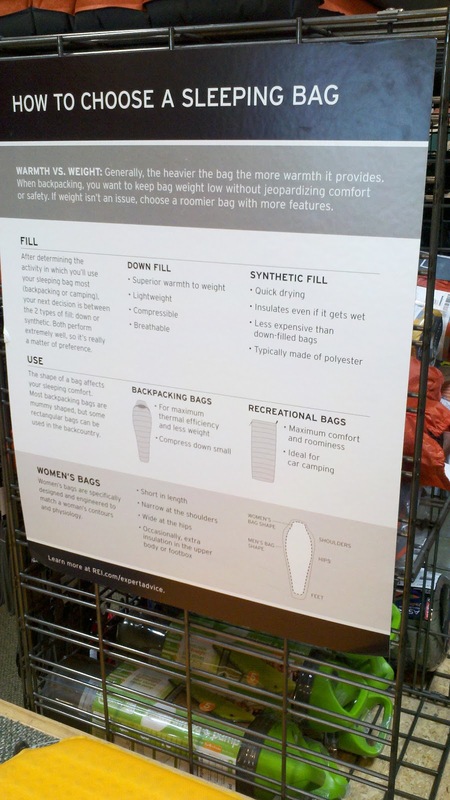 Signs like “How to Choose a Sleeping Bag” help customers understand the differences between options and clarify what their needs are. 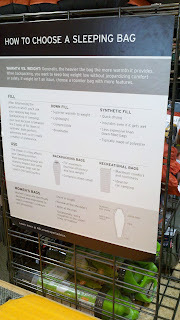 Case in point: I hadn’t ever thought about how I might need a different bag than a man would, but thanks to REI, I feel more knowledgeable and equipped with the right bag. 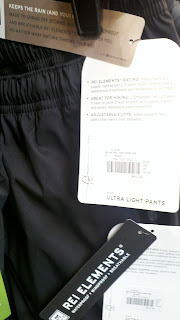 Hang-tags are another way REI leverages expertise to point people to the right product. Their tags tell you what the product is good for, how it compares to other options, and what distinguishing features it has. The tags and signs are simply designed and expertly written, so they make a wealth of information accessible and digestible. 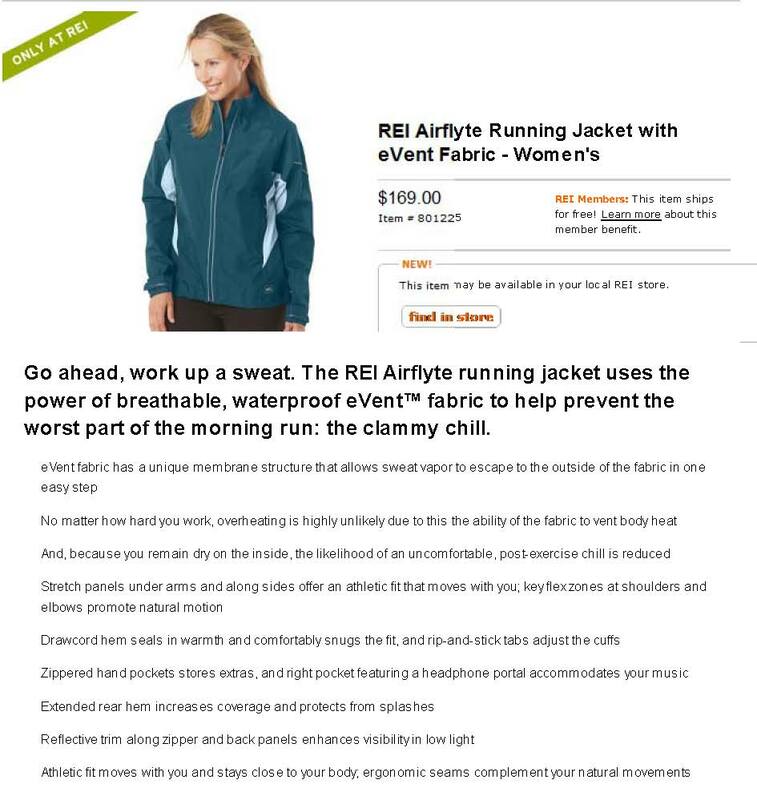 On its website, REI uses detailed product specs and reviews to help people make confident choices. The product specs answer practically every question you might have. And for product reviews, they don’t stop at a numerical rating and simple comment box. The review protocol is thorough, so if the reviewer completes all the fields, you can see where the reviewer is from, what kind of person the reviewer is (avid adventurer vs. casual/recreational vs. gym rat, etc.) and their preferred gear style, if the product was a gift, the product’s pros and cons, best uses, and the bottom line. All of this goes a long way to re-assure a wary customer. 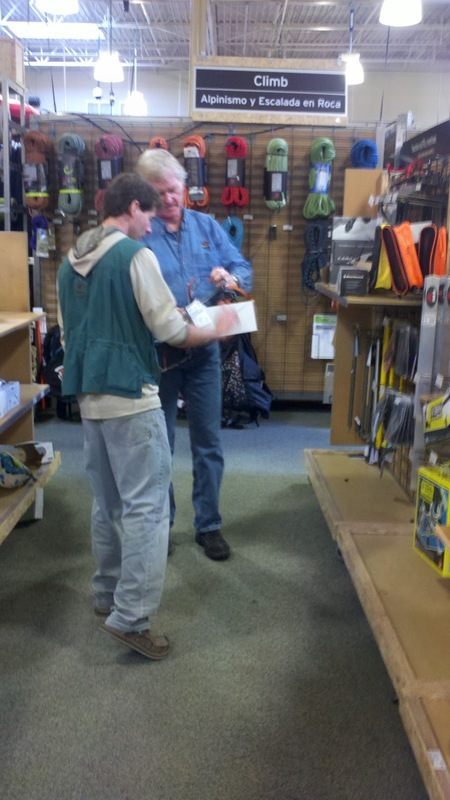 Perhaps the most significant example of creating confidence through expertise is the REI sales associates. They’re knowledgeable, friendly, and available – a powerful combination. When you don’t know something, they don’t make you feel stupid; when they don’t know something, they find another associate who does. If REI’s phenomenal financial results are any indication, (in 2010 sales were up 14%; profits, 15%; same store sales 8.1%) many people are choosing REI – including me! Thank you, Denise! I'm eager now to visit an REI to experience for myself how easy they make choosing. Having read Denise's post, what do you look for when you're choosing from a multitude of products? What makes your purchase decisions easier? When you consider choice and your retail experience from your customers' perspectives, how do go about creating an environment that generates confidence in your customers? Greetings! Here is the 5/20/11 issue of Retail Experience in the News... recapping the latest articles and links shared on Twitter with the #retailexp hashtag this past week. Urban Outfitters' Dmitri Siegel described UO's social media strategy at Fashion140, my first 140conf, which took place on 5/4/11 at Alice Tully Hall in Lincoln Center, the new home of Fashion Week [remember Fashion Week in Bryant Park for those of us who worked close by?]. For the record, 140confs are intense affairs! Speakers have 10 minutes in which to tell their story. Fashion140 boasted 60 leading speakers, 1,000 attendees at the hall and 17,000 more online... I'm still sifting through my notes and appreciate that so many others captured highlights online! I admire Urban Outfitters and routinely bring them up when I talk retail experience. I've written about them, too! See Retail Innovation and Urban Outfitters, and Urban Outfitters: Be Where Customers Are. You can imagine how delighted I was to hear Dmitri Siegel, executive director of marketing for Urban Outfitters, speak. The photo above captures Urban Outfitters' social media strategy: Think. Connect. Listen. Party. Measure. Urban Outfitters' goal is to form a bond with customers that's deeper than shopping, that sustains them in between transactions; everything else flows from that. Social media is a pillar of Urban Outfitters' retention strategy. Connect customers to people who represent the brand [e.g., emerging talent in music and style --> free music on #MusicMondays. Connect customers to each other [e.g., Facebook, Ask/Answer, ratings/reviews]. Connect with your customer. Listen: most brands only talk about themselves all the time! For a fashion brand, it's a different kind of listening. Lots of subjective insight. Get to core insights. Party = wildcard! Does the social media presence capture the essence of the brand? Has to feel like who you are otherwise you won't get the right fans and have the right interaction. Measurement: align measures to objective. His master, killer KPI is total interactions, not sales. It shapes how he creates content. Also, measure what you can measure. Focus dollars on customer experience rather than elusive measures. Succinct, simple and intensely focused on the customer retail experience. Check out the Urban Outfitters Community Page to see it all in action. Can you think of other organizations that are similarly focused? You can watch Dmitri Siegel's presentation from the Fashion Lincoln Center recording of the event. Click on the first purple button [for the morning video feed] on the right hand side in the middle. His talk starts at approx. 17 minutes. Wishing you a wonderful weekend as you savor the 4/13/11 issue of Retail Experience in the News... recapping the latest articles and links shared on Twitter with the #retailexp hashtag this past week. Help for a Survey on Lead Generation! I need your help for a survey on Lead Generation! Could I impose on you for a few minutes? This is to find out how you generate leads for your business. I'm hoping you'll share with me insights on and experiences with what has worked best for you in generating leads. Also, have you seen successes in integrating social media into your lead generation process? I'm conducting this research for a presentation that I'm putting together [more on that in a separate post] and expect that this will also lead to a blogpost or two... 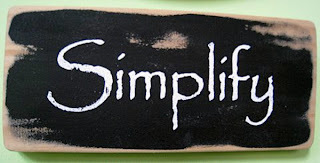 I will definitely share with you what I learn on the Simple Marketing Blog [and here via my monthly update]. To participate, please click here to take the "How Do You Generate Leads?" survey. If you have any questions, please don't hesitate to contact me. Responses due ASAP or by Friday 5/13/11. Feel free to share this link with others, too. Greetings! I hope April treated you well and that May looks to be full of promise. How are you finding business? I'm hearing reports of cautious optimism. Is it the same for you? I'd love to hear more. Meanwhile, here follows the April 2011 update from Simple Marketing Now with posts categorized into Social Media Marketing Resources and Simple Marketing News. Please pay special attention to the update of the Social Flooring Index. This update highlights many changes since August 2010 and I'd love to hear your reaction. I also summarized for you my Coverings 2011 presentation: How To Improve Your Digital Visibility: Coverings2011, detailed the FCA Network Annual Convention Presentations, described the experience of participating in the Surfaces StonExpo 2012: Education Program Planning and highlighted my contribution to Chief Content Officer Magazine & Technology!. The more I am immersed in social media marketing, the more critical I consider guidelines. Interestingly, companies have plenty of opportunity to do better as I discovered researching Facebook Fan Page Guidelines or House Rules and LinkedIn Group Guidelines or Rules of Engagement. What are your reactions to guidelines and house rules? My March 2011 MarketingProfs article became a Get to the Point short article in 10 Reasons You Shouldn't Ignore Social Media. I'd love to hear your take on How Are You Finding New Customers? Finally, here are the latest links to articles and news about practical marketing on Twitter, coded #PracticalMktr: Practical Simple Marketing in the News - 4/22/11 and Practical Simple Marketing in the News - 4/29/11. As always, Thank You for reading. If you enjoyed this article, perhaps you would consider subscribing to Flooring The Consumer via email or RSS. Here is the 5/6/11 issue of Retail Experience in the News... recapping the latest articles and links shared on Twitter with the #retailexp hashtag this past week. OfficeMax Bob Thacker talks #retailexp, design, women http://ow.ly/4LKvR Fascinating! Meet Olga Robertson, president of FCA Network, an alliance of floor covering retailers. She is one of very few women leaders in the floor covering industry. In her role with FCA Network, she is fiercely focused on the success of her members. I first met Olga when she participated in a panel discussion at Surfaces. I describe that presentation in Lis Calandrino - Tips From the Trade. Only recently did I have the opportunity to work closely with Olga in preparation for the 2011 FCA Network annual convention [described in FCA Network 2011 Annual Convention Focused on ‘Getting More for Less’ and FCA Network Annual Convention Presentations]. I witnessed firsthand her intense passion. Olga graciously agreed to participate in this Woman in Flooring interview. C.B. : Olga, please tell me about yourself and your background. OR: My parents immigrated to this country because they wanted to make a better life for themselves and their family. I was born in Naples, Italy, the first of 4 children. My sisters were born in this country. Dad worked at the steel mill and mom worked at home. As a young girl, raised in a lower middle class family with a strong work ethic, there was simply no excuse for not working hard and taking your education seriously. I was privileged to have a parochial education for 12 years with 4 years in an all girls’ high school... actually that was the best time of my life. One thing my father always said to me, which I never really understood until I was in the workplace, was “not to expect something for nothing.” Mom, the disciplinarian and the nurturer, always told me I could be anything I wanted to be. So at a very early age I knew that if I worked hard and applied myself I could make more money than my father... Unfortunately not many young people coming out of college today will be able to do that based on the statistics that we are so painfully aware of. I learned the important lesson that to live the American Dream required discipline, a lot of determination and the right opportunities... and this is where Bob Hill comes into the picture. Anyway, I finally called Bob and started one week later right after Christmas... on January 3, 1978. He was willing to pay me $15.00 more per week and I thought, sure, I can do this and continue to look for something else. If you hear Bob Hill tell the story I was there for 30 seconds and started running the place... It wasn’t quite like that, but I was fortunate to be hired by someone who recognized my talents and work ethic early on and gave me so many opportunities to prove myself. I adopted an attitude of listening and learning from other successful people. C.B. : What is FCA Network? OR: FCA Network is a group of licensed retailers across the country who benefit from our buying power and expertise in the floor covering business. We offer all the same things that other groups do for a lot less. Our USP [Unique Selling Proposition] is that we are successful retailers helping other retailers. I like to say that we are the smaller group that THINKS BIG. We also intervene on behalf of our members to resolve claims and expedite orders because we know first hand how difficult it is to sell the customer the first time much less have to do it a second time because the mills can’t ship product. C.B. : What do you like most about the flooring business? OR: What I like most are the people in the industry..... That’s why I stayed in this industry. There are some really fine people in this business: Carl Bouckaert, Ralph Boe, Vance Bell, Randy Merritt, John Godwin to name just a few. I’m blessed to have met and worked with talented and passionate people just like you. I’ve worked with and learned from the best. C.B. : What do you like least about the flooring business? OR: I could live without the customers.....:-)! I suppose it’s the challenges we all face in an imperfect world that seem to be even more intense or magnified in retail floor covering. In order to satisfy a customer you must do everything perfectly.... 100% in an imperfect world is a very tall order. You have to count on so many people to do everything 100% all along the chain.... It’s not easy. C.B. : What would you do differently to improve the flooring retail experience? OR: Have QR tags on every sample from every supplier. We would download our custom app to whatever mobile platform with information from all our vendors and have immediate access to our pricing, specifications, inventory, etc. Wouldn’t that be a great sales tool.... and so cool! I’m struggling with this because there’s a pre-supposition that I would have some form of control over the retail experience from the stand-point of a teacher, coach or manager. This is “old school” but I believe it’s the student’s responsibility to learn not the teachers to teach. Teachers, Coaches, Managers should inspire. This is a business for self-starters and entrepreneurs. It’s not for the timid. C.B. : How do you see blogs and social media affecting the flooring industry and your members? OR: That’s the $64,000 question. I don’t know. I do know that there’s a lot of talk about it, a whole lot written about it, and no one wants to be left behind. I suppose when the pain of not utilizing social media tools is greater than the pain of doing it, we’ll move that ball forward. C.B. : Any parting words of advice? OR: Yes, stay positive, keep smiling and don’t take yourself too seriously. You know our motto: have fun, make more money and have more fun! Comments, questions, reactions? What advice do you have for succeeding in business today? How do you balance customer expectations with the realities of your industry? How would you use QR codes to facilitate supply chain communications?